Keren Price began medical writing in 1997. Over the years, she has written for a wide range of clients, including Medtronic, Salix Pharmaceuticals, and General Mills. Prior to her medical writing career, Price was the managing editor of the Journal of Nutrition Education. She earned a Bachelor of Science in biopsychology from Tufts University and a Master's degree in nutrition from Penn State. If you suffer from acne -- a skin condition that causes blackheads, whiteheads and other types of pimples -- you are not alone. Acne is one of the most common skin diseases in the United States. According to the American Academy of Dermatology, this skin condition affects up to 50 million people each year. 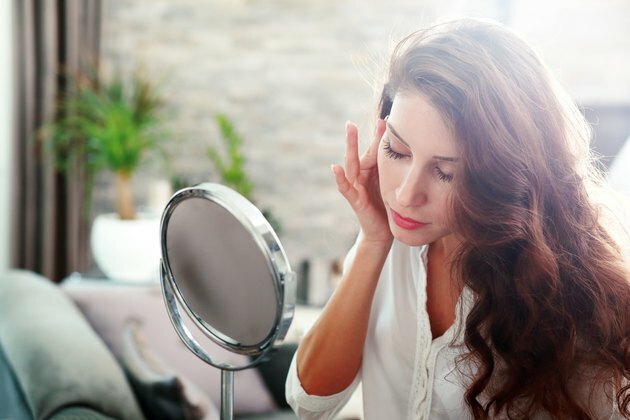 Acne occurs when an enlarged skin pore becomes blocked with dead skin cells and sebum, an oily substance produced by the skin, creating an environment for bacterial overgrowth. There are many effective treatments for acne, and several vitamins -- vitamin A, nicotinamide and vitamin E -- may play a role helping to keep your skin clear. Topical retinoids, prescription vitamin A formulations typically used for blackheads and whiteheads without skin inflammation, help treat acne by normalizing skin cell turnover and unblocking pores. A systematic review published in the August 2004 issue of the "Journal of the American Medical Association" reported that several common topical vitamin A formulas were effective acne treatment. These topical retinoids decreased the number of pimples by 40 to 70 percent, with visible improvement occurring within 8 to 12 weeks of starting treatment. An oral form of vitamin A -- the retinoid isotretinoin -- is used to treat more severe, inflammatory acne when other medications fail to work. It is also only available by prescription. In addition to normalizing skin cell turnover, isotretinoin also decreases sebum production. According to a review published in the October 2012 issue of "American Family Physician," after 20 weeks of isotretinoin treatment, 40 percent of people with severe acne required no further treatment, 40 percent required additional treatment with topical medication or oral antibiotics, and 20 percent required a second course of isotretinoin. Nicotinamide, a form of vitamin B3 or niacin, has been used topically to treat acne. A small study reported in the 2008 issue of the "Journal of the Turkish Academy of Dermatology" found that application of a 4 percent nicotinamide gel for 8 weeks significantly decreased the number of pimples in people with mild to moderate acne. The authors attribute these results to nicotinamide's anti-inflammatory properties but note that larger studies are needed to confirm their findings. Oral nicotinamide also appears promising. More than 85 percent of people who took an oral supplement containing nicotinamide, zinc, copper and folic acid for 8 weeks reported that their acne was moderately or much better, according to a study published in the January 2006 issue of "Cutis." However, this study did not include a control group that received a placebo instead of the supplement, which limits the conclusions that can be drawn. The U.S. Food and Drug Administration has not approved this supplement for use in acne treatment. Like nicotinamide, the relationship between acne and vitamin E isn't as well studied as the more well-established relationship between acne and vitamin A. Research published in the May 2006 issue of "Clinical and Experimental Dermatology" reports that a group of 100 newly diagnosed and untreated people with acne had vitamin E blood levels that were significantly lower than vitamin E levels in people without acne. A study published in the June 2014 issue of "Cutaneous and Ocular Toxicology" also reported a link between low vitamin E blood levels and more severe acne. However, this research does not prove low vitamin E causes acne or that supplemental vitamin E treats acne. More research is needed to better understand how vitamin E might impact acne. If you suffer from acne, speak with your doctor or dermatologist about your treatment options. While certain vitamins are useful in acne treatment, some of these therapies are prescription-only and some contain vitamin amounts high enough to require monitoring by your doctor. Some of these treatments also pose serious side effects. For example, isotretinoin increases the risk of serious birth defects and pregnancy loss and must not be taken during pregnancy. Your doctor can explain the risks and benefits of proposed acne treatments. Always be sure to check with your healthcare providers before taking any nutritional supplement to treat a medical condition. Clinical and Experimental Dermatology: Does the Plasma Level of Vitamins A and E Affect Acne Condition?